How you go about this and, in fact, whether you do this at all will depend on the size of your carving. You must remember that you are trying to represent hair or fur and, if the carving is too small, this can be almost impossible to do effectively and it might be better to do nothing at all. Someone once asked me what all the scratches were on one of my netsuke carvings and I replied that they were meant to be fur. He then asked if they looked like fur and I couldn't do anything but reply that they didn't. His response was to ask why I had done them at all then. There was no answer to that. 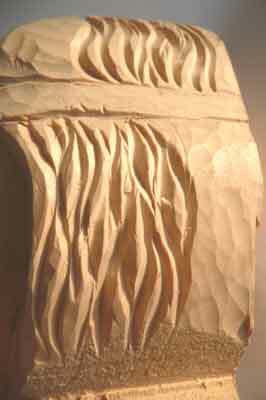 As most head carvings that are produced are much less than full size there is necessarily a need for a degree of stylising in any hair carving that is added. 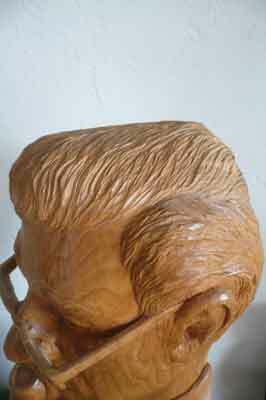 What the carver is actually aiming at is to give the impression of hair rather than to make it realistic. There are many ways to achieve this and all of them work so it is really just a matter of choosing the method that works best for you. For the smallest heads I tend to use different sizes of parting or 'V' tools and, for the larger heads, I would add a small veiner or even a macaroni. These will give a softer look and can also produce a layering effect. 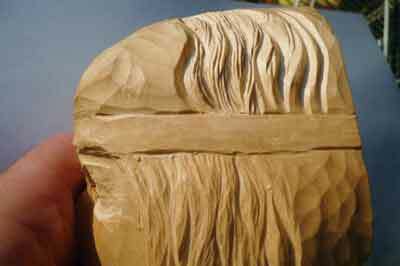 If you are carving full size or similar you might like to use a variety of bull-nosed gouges working in a sideways, slicing motion to give you the various sweeps of the hair. This can be very impressive and can result in some really dramatic hair effects but does need a considerable amount of practice to get it right. The smaller the head, though, the more difficult it is to do. Once I am happy with the initial blocks I have formed I go over them with a finer tool until it looks right. Sometimes the result gives a hard effect and, if this is the case, I will go over it with a very fine veiner to soften the cuts. I would recommend, if you are not sure how it will look, that you practise on a spare piece of wood. I have a collection of part-carved heads that I use to practise carving eyes, noses, mouths and hair. It doesn't take long to do one of these in something like jelutong (Dyera costulata) and it can save you a lot of frustration and heartache when carving your 'masterpiece'. The main rule about carving hair is that you don't want any straight lines, each cut should be an elongated 'S', in either direction. Don't be worried if they overlap each other. This will actually add to the effect. This is not too different from carving hair except that the whole surface is much smoother, generally without the clumps of hair that you would carve on a head. Your cuts should still be the elongated 'S' shape but may well be very much shorter. For very short-coated animals you may even just cut short, almost straight lines. You will mostly use a very small 'V' tool or veiner for this. 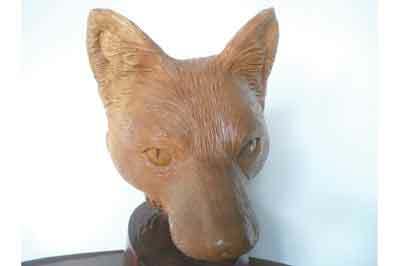 You will need to be aware of the grain direction throughout the process and, ideally, you want to be carving from the base of the fur to the outside as this will give a finer finish but this will not always be possible. Always take care that the corners of the 'V' tool don't get buried in the wood - sometimes you may be better using a larger tool with a shallow cut than a smaller one. There are, however, two important things to remember. 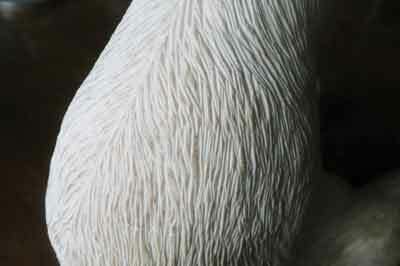 Firstly, you need to prepare the surface before you start carving the fur. It needs to be carefully finished to the final shape that you require - once you have carved the fur you cannot do anything else to the carving. Don't leave it rough under the impression that carving the fur will put it right - it won't. Many carvers I know will actually sand the finish before texturing it but I think that careful tooling is generally enough. Whichever you choose, do make sure it is clean. The second point is that all animals have a correct hair tract. This means that the hair goes in a specific direction around the body with little spirals in certain places where changes of direction occur. You must study these before starting to texture. Look at your dog or cat, stroke it and feel which direction the hair goes and you are well on your way. Many animal carving books will show you the correct hair tracts - study these if you can. There is nothing worse in a carving than to see a lot of straight lines carved in totally the wrong direction supposedly representing fur. I recommend that you first establish the hair tract pattern with a small veiner going over it with progressively smaller 'V' tools until it looks right. It can be a long drawn-out process but will be worth it for the end result. If you are more interested in carving netsuke or other miniatures you can get a very effective hair or fur effect with a pyrography tool. This needs to be the small scalpel type blade that the bird carvers use to produce feathers. If the heat is turned right down, a very fine cut is produced that won't close up as it would if done with a scalpel. By following the same lines as with the 'V' tool you will end up with a similar effect but much finer. As mentioned earlier, the harder the wood the more effective the result. As with all skills, for success you need to practise - you cannot hope to get it right first time.